Palmetto Road laminate offers the elegant look of hardwood at an affordable price. Laminate is a multi-layer synthetic flooring product made to resemble hardwood floors. It is highly durable, stain-resistant and easy to maintain. It is ideal for high traffic areas in either a home or office. Laminate floors are made up of a decorative layer, core layer and backing layer. The decorative or surface layer is what gives the beauty and elegance of actual hardwood. This layer is a high-definition photograph of a particular wood species which is sealed using a melamine resin-based coating containing aluminum oxide. This coating gives the floor its resistance to scratching, UV rays, burning ash and chemical agents. 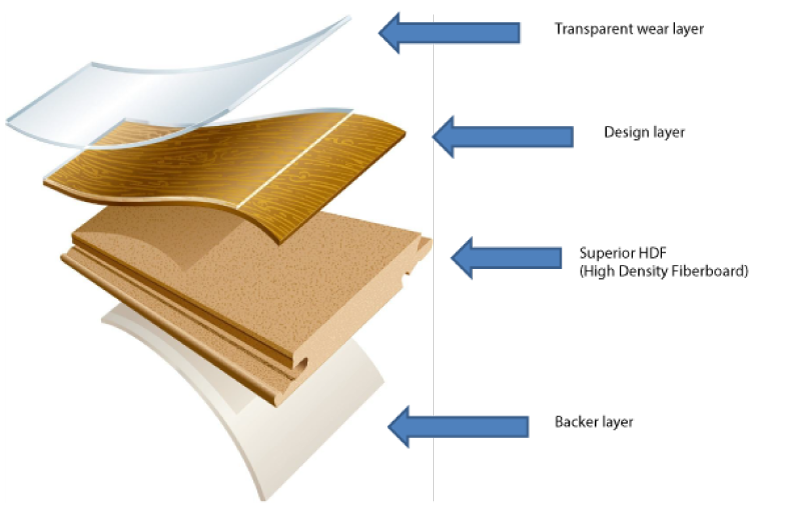 The core layer is what gives the laminate its durability. The core is made of a highly compressed High Density Fiberboard (HDF). This is what allows the floor to take the shock of localized impacts such as high-heeled shoes and dropped objects.The backing layer is the layer that binds the laminate together and gives it stability. The backing layer is made to float over-top of the foam underlayment which makes the laminate a floating floor. The floor can be damp mopped with clean warm water and a diluted floor cleaner as needed. Do not use harsh cleaners or chemicals, abrasive scrubbing pads, abrasive tools, or abrasive cleaners as they can scratch the floor. Do not use detergents and do not use floor shining products like “mop and shine” on the floor. learn about laminate floors. learn about laminate floors. Are Palmetto Road laminate floors CARB II compliant? Yes. All Palmetto Road products adhere to strict environmental and safety requirements. Palmetto Road laminate floors meet California Air Resources Board (CARB) compliance’s including CARB Phase II for formaldehyde emissions. What does AC ratings mean? AC ratings help consumers identify the usage level on laminate flooring products. AC ratings rank laminate’s resistance to abrasion, impact, stains and cigarette burns, as well as, how the product has been tested for common wear. A rating on a laminate product indicates it has passed all of the test criteria. AC ratings are divided into residential and commercial groups. Each group is then divided into traffic intensity levels: moderate, general or heavy. A higher AC rating indicates higher wear resistance. Where can I purchase your floors? You can purchase our Palmetto Road laminate and waterproof flooring through an authorized dealer in your area, see our find a store to find your nearest dealer. To purchase Palmetto Road hardwood flooring, please visit our hardwood dealer locator. If you can’t locate a dealer on the map, please email info@palmettoroadflooring.com or call 855-212-9888 and we can help you find a retailer. I'm a retailer, how do I become an authorized dealer for Palmetto Road flooring? Palmetto Road laminate floors are distributed by Southern Diversified Distributors. To become an authorized retailer, please complete and submit the contact us form.